As a student of both Journalism and Graphic Design, magazines are my cup of tea. I devour all of the articles, and I am always intrigued by print design. Unfortunately, some smaller magazines have fallen victim to the advent of digital production, and even some of my favorite magazine stands have closed. But there are a few that have stuck around, and of course…as a mom….my life is full of baby magazines right now. But, then there lies that problem after you’re done reading them…what to do? You can’t just toss them. Totally not good for the environment, and what if you need to refer back to them in the future? So you keep them around. And they stack up and stack up. 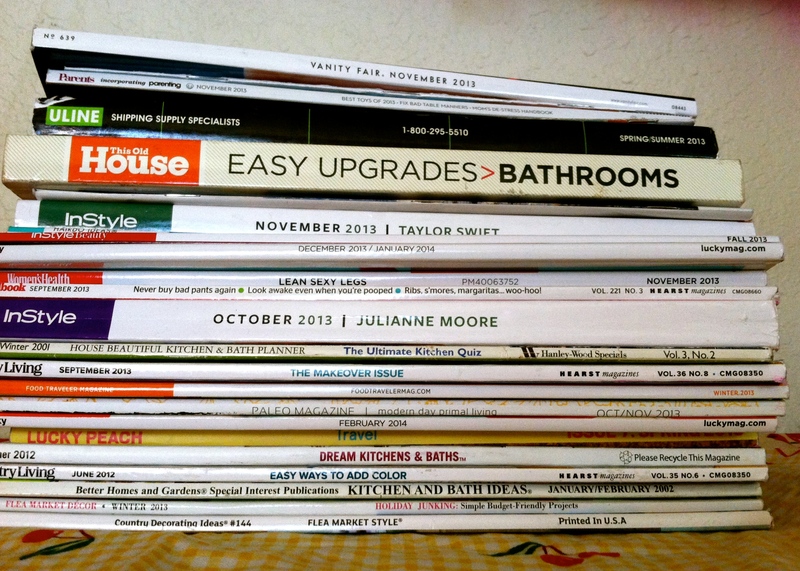 And soon enough, your entire room is surrounded by stacks of magazines. Oh, is that just me? My love for crafting has made this a simple fix. It’s time for some paper mache, y’all! I’m working on a project for a future article, and I thought I would share some inspiration for the project. I have a lot of ideas running around my head, and since this is something that will stick around my house – I want to make sure I love it and it will make sense. I am not a fan of taxidermy. I think it’s sort of neat in photos, but when I come face to face with a buck staring at me through it’s dead eyes, I can’t hang (no pun intended). But paper mache taxidermy – that’s something I can get down with! The full tutorial along with photos can be found at Stars for Streetlights. For this project, Ashley from Lil Blue Boo did not use any template, she just crumbled up newspaper into balls and shaped it to make the unicorn. Obviously, there was more involved, but that’s how she got the basic form. It took her about four hours to complete it, and the unicorn had to dry overnight. Ashley hung it up in her daughter’s playroom, and I’m thinking Cecilia’s room would be quite fancy with one. Let’s say you want to paint your animal head, which I think I would do. Isabel, who runs Bel & Beau contributed this tutorial to A Little Artsy. She used an animal mask from a craft store as a guide for her animal head, and then hung it up in her son’s room. Since there are a lot of babies who will be gracing our lives with their presence in the next couple months, I think this would be the perfect gift for a nursery. I’m definitely making one for Cecilia’s room, just need to figure out what animal to make after we get her room all figured out. Do you have any fun paper mache tutorials to share, or did you make an animal head with one of these tutorials? Share the link in the comments and on Facebook, Instagram, Google + and Twitter! Find more animal mache inspiration on Pinterest! Posted on March 21, 2014 by amanda branham •	This entry was posted in Crafts and tagged a little artsy, animal, article, articles, ashley, baby, bel & beau, contibute, craft, crafting, cup of tea, desig, design, digital, DIY, fan, gift, graphic, guide, heads, inspiration, intrigued, isabel, journalism, lil blue boo, love, mache, magazines, mask, nursery, paper, photos, print, production, share, stars for streetlights, store, student, taxidermy, tutorial, unicorn. Bookmark the permalink.